I am posting this after I had a discussion with the Village Solicitor who told me that what I said about the payment made to the band by the Village didn't necessarily cost the Village anything. I was told that it was possible that the sponsors often give a check to the Village and then the Village pays the bills from the proceeds of that check. Now I NEVER want to post something that isn't true regardless of who it may help! My goal on this website is the truth. So I submitted a public records request for all payments from the sponsors and all payments from the Village related to the Concert in the Park. If I can verify what I was told then I will retract the cost to the Village segment. What I told the Solicitor was that what I posted is what was said and written so the story stands as is at least until I receive the public records which will show us the truth. So read what I wrote if you want but do visit this page if you see another update and then you can see the end of the story. As far as my opinion about the conflict of interest it will not be changed. I wrote a page a week or so ago about Ellington and his connection with his E-Funk band. I freely admit that it was in poor taste as was pointed out by Mrs Ellington in her feedbacks (click here to view) regarding the page. Not only that but after the feedbacks and the review I made of the content I also realized that I had failed completely to make my point. I am perfectly capable of doing some dumb things so it should come as no suprise to anyone that I failed in my attempt to even get my point across! Stupid, eh! But the one thing I believe I can say about myself is that when I do things like this and get slapped in the face for them I make every attempt that I can possibly make to right the wrong. I don't lie about it, I don't create stories to cover up my shortcomings and I try my best not to rationalize my actions by "glossing over" what I have done! I did it, it was in poor taste, I have tried to right my wrong, and I have no quarrel with Melita Ellington who I evidently hurt which I deeply regret. My colleagues even tell me that Melita is a very nice person who does wonderful things for folks here in Amelia such as helping with the Christmas Parade, et al. That certainly does not make me feel any better for having hurt her either! Now having said that I am about to write something that will hurt her again because it is about her husband and his band. I regret hurting her this time as well but I cannot let that interfere with my quest for the truth! The point that I was trying to make had to do with conflict of interest and the truth! I suppose that a lot of people don't even think about things like that when it comes to events like the concert but since I have started to look into matters concerning the dissolution of the Village I fully realize that the current Administration is not worthy of representing me or anyone else. The lies and threats sent to us on August 11th, 2008 proved that to me beyond a shadow of a doubt. Since that time I have discovered so many that I may never have time to post them all. And to let these lies and deceptions go without retraction by anyone is shameful, dishonable and should be dealt with by getting rid of the organization that supports them by dissolving the Village. They do not represent us they represent themselves! The next thing I want to show you concerns conflict of interest. If you would please click here to read what it is. I admit that I don't trust Ellington any farther that I can throw him so when I made the connection between Ellington and the E-Funk band I immediately saw it as a conflict of interest! Concert In The Park, Ellington's band, Amelia listed as customer, they are being paid. It's that easy and it is a conflict of interest. I cut out a little of the description for you to make my point. "A conflict of interest exists even if no improper act results from it, and can create an appearance of impropriety that can undermine confidence in the conflicted individual or organization. A conflict can be mitigated by third party verification or third party evaluation noted below - but it still exists." If you can explain to me where I am wrong about this send me a feedback and if you manage to change my mind I will post it, but it better be good because I consider this beyond doubt. Now let me go to the next step and that is the truth part. 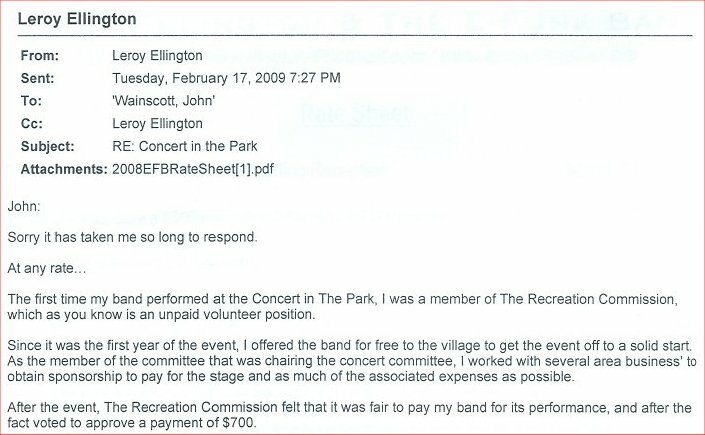 In the threat letter of August 11th, 2008, which belongs to Ellington and Menz, he states on page 3 under AMELIA EVENTS, Village Summer Concert in the Park, "The costs of this event are covered by sponsorships of local businesses." The following is an excerpt from an email obtained from the Village using a public information request. Pay special attention to the very last line. What would you therefore call his statement form the August 11th letter? An attempt to cover up the fact that it did cost the Village something? He just forgot but suddenly remembered on February 17th? Or maybe he does "what ever you want to call this" so many times that he forgets these "what ever you want to call this" and therefore continues to keep doing "what ever you want to call this" because he becomes confused by the "what ever you want to call this" that he is trying to tell you now! As for myself I'm going with the latter. Now you can sit there all day and tell me that "oh, it's only $700.00, no big deal" and if you do think this you deserve what you are getting. But as for me it is a big deal! Our government officials shuold never do anything that can be viewed as a conflict of interest or "what ever you want to call this"! NEVER! You can tell me that perhaps Ellington didn't know what a conflict of interest was. If he came out and said that this would be forgivable but under the circumstances it just appears he has "what ever you want to call this" and has simply forgot that he "what ever you want to call this" and made a blunder because he admitted actually receiving money that he told you he never received. If it would have been me and I had a band and I wanted them to play at the concert in the park the only acceptable way would have been to have them play FREE OF ANY CHARGE! But by definition that is still a conflict of interest! But since I do know what a conflict of interest is my band would have never played and there would not have been a conflict of interest or a "what ever you want to call this" in the threat letter of August 11th !!! If the Village is dissolved there will never be another conflict of interest or a "what ever you wnt to call this" from the Village Administration again!